On Wednesday 17th May, Michael Eavis CBE officially opened The Mendip School, a special school for 120 pupils aged 4 to 19 located on the Bath and West Showground near Shepton Mallet. 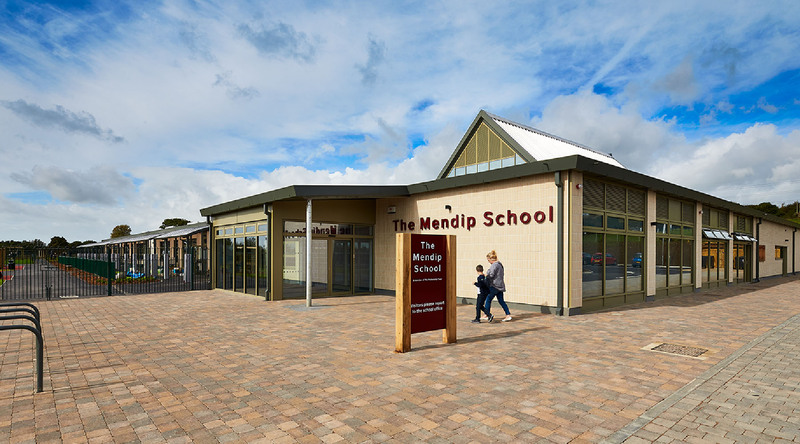 Mendip School is an easy building; easy to build, easy to navigate, easy to use. It is not frivolous. It is functional, practical and works very well. It’s mainly about putting rooms in the right place. The primary school classrooms face south so the sun warms the external teaching space where the children spend so much of their time whereas the secondary school classrooms face north, enjoying daylight without the glare of the sun. The shared practical spaces, the library and hall are right in the middle, easily accessible to all. The big rooms, however, are often easy to locate; it is the myriad of minor rooms, the toilets, stores, offices and group rooms that cause complications. A common problem is the need to place small and large rooms next to each other when they both need a view, without the external wall, or the corridor going in and out all over the place. 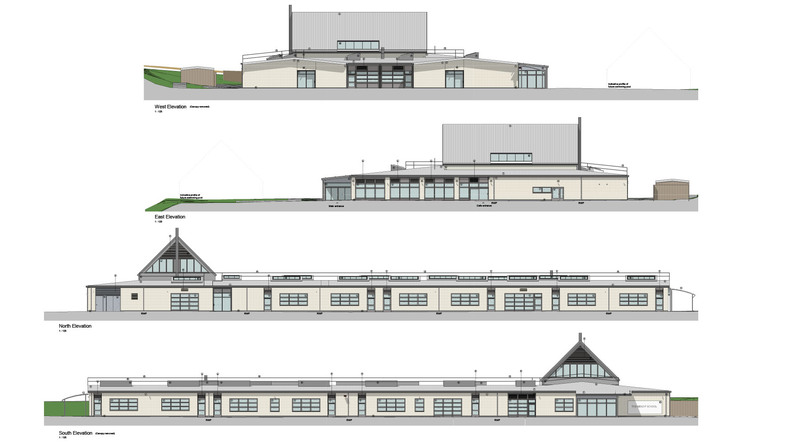 Mendip School is a very simple shape, yet all the rooms that require a view have one regardless of size. The external walls are straight and short in length compared to the floor area, making it very efficient, minimising heat loss, maintenance, and the cost of those expensive external walls. Working out where rooms should go is not just about functionality, or efficiency, it is also about creating the right feel, and the right connections with the outside. At Mendip a central courtyard is the heart of the building; a space shared by all. Circulation serving both the primary and secondary pupils open onto this space as does the glazed wall of the library enabling pupils to sit outside with their books enjoying the warmth of the sun and shelter of its walls. The entrance to any building is important. Here, a small entrance plaza provides a gathering space before passing under the canopy into the large glass lobby, and then into the spacious reception with its open counter and comfy seating. From here you can access meeting rooms or even the hall, without entering the working school environment. There is also a café at Mendip where pupils learn to cook and serve the public. This requires an entrance that is immediate, obvious, and inviting, and a fully glazed shopfront overlooking the car park fits the bill. 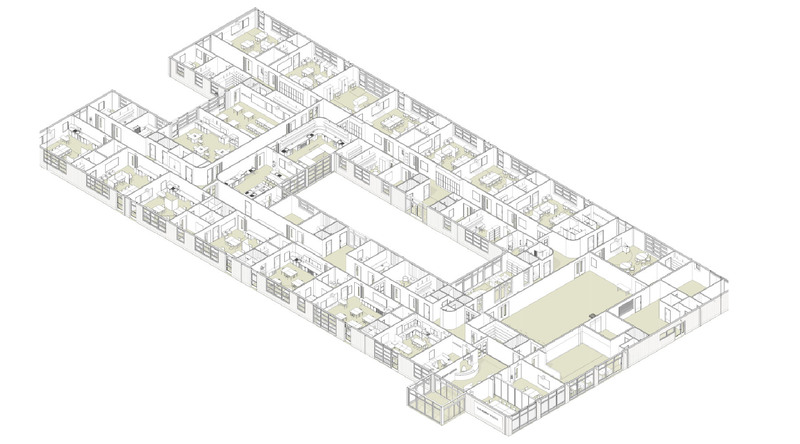 Mendip School is more than an agglomeration of rooms however, it is also about space and light. All of the teaching spaces have huge skylights, tilted north and fitted with frosted glass flooding the interior with diffuse daylight. 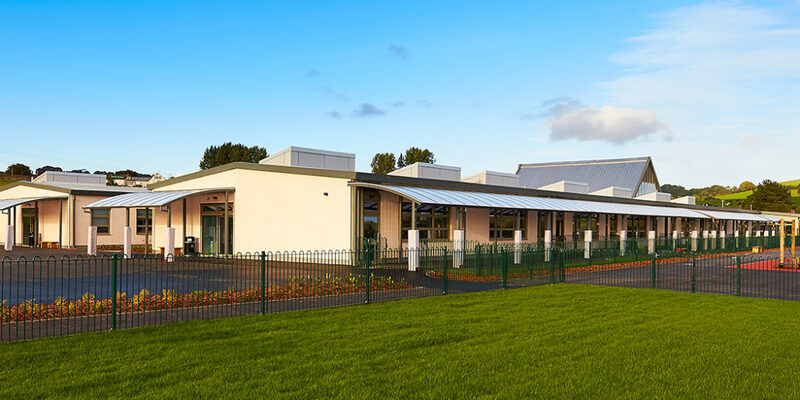 A translucent canopy runs the full length of those south facing classrooms cutting glare and avoiding the perennial problem of blinds constantly rolled down. The even gentle light, plain white walls, and wide corridors contribute to a sense of calm and tranquillity, of particular benefit to these pupils. The hall is also an exercise in controlled daylight with translucent windows and rooflights to three sides, and to the north, a fully glazed gable giving clear views of the Mendip sky. In appearance the building is simple and straightforward. The steep pitched roof to the hall, with its glazed gables, rises high above the shallow pitch roofs to the rest of the school. The oversized perimeter gutter provides a strong eaves line, beneath which the panels of buff brick and big aluminium windows skirt the building. The understated simplicity is almost agricultural in appearance, which is somewhat appropriate to its rural setting. Mendip School is an easy building. It is not frivolous or wasteful; it is not extravagant or ostentatious. It is a simple functional building that is an attractive and enjoyable place in which to work and learn, and that is not always so easy to achieve.